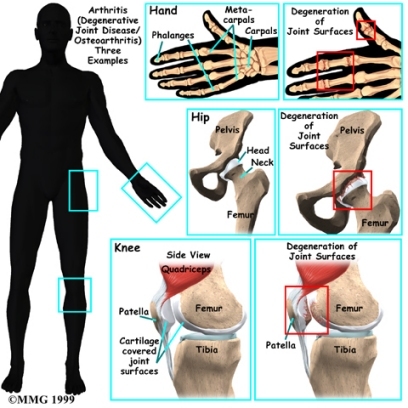 The type of arthritis most frequently seen is osteoarthritis or degenerative arthritis or degenerative joint disease, because it is associated with the aging process. Osteoarthritis affects some 16 million Americans alone (many of whom do not realize they have it). It causes the cartilage covering the end of the bones gradually wears away, resulting in painful bone-on-bone rubbing. 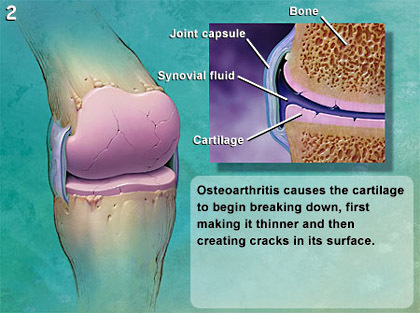 All of the joints may be affected by osteoarthritis. Abnormal bone growths, called spurs or osteophytes can grow in the joint. These bone spurs add to the pain and swelling, while disrupting movement. Osteoarthritis can range from mild to severe. Osteoarthritis is often more painful in the weight-bearing joints, including the spine, hip and knee, and the pain is usually is made worse by movement. Osteoarthritis can occur in young people as the result of an injury or from overuse of a joint during sports or work. Joint pain and swelling after activity. Stiffness in the joint after inactivity. A grinding sensation when the joint is moved. If the arthritis is in the cervical (neck) or lumbar (lower back) area of the spine and has caused changes that put pressure on a nerve, then numbness or tingling in an arm or leg can happen. Alternative treatments for osteoarthritis include platelet-rich plasma (PRP) and stem cell therapy, which may be effective in helping to regenerate cartilage and joints ravaged by osteoarthritis or degenerative joint disease. Platelet-rich plasma and stem cell therapy are cutting-edge medical procedures that may help reverse or regenerate the destructive process in the rheumatoid afflicted joint. Platelet-Rich Plasma (PRP) therapy captures the healing growth factors that are in a person’s own blood. By injecting the PRP into the area damaged by rheumatoid arthritis, it may help heal the affected area and diminish pain. In addition, there are indications for platelet-rich plasma in healing a variety of conditions, in much the same way that stem cells may be used to help regenerate different types of tissues. Nutraceuticals may play an enhancing role with the platelet-rich plasma (PRP) and stem cell technology. If you continue to suffer with osteoarthritis and your current treatment plan leaves you feeling hopeless, perhaps a fresh set of experienced eyes can change your outlook. Since 1990, Dennis M. Lox, M.D has applied his personal interests in sports medicine, cutting-edge regenerative medicine and chronic pain management to helping patients increase their quality of life. Contact us for an appointment at 727-462-5582 .